What are Brachiopods? Brachiopods are marine animals that have a calcium carbonate or calcium phosphate shell made of two valves, which usually differ in shape and size. Brachiopods are closely related to the bryozoans. Both groups possess a unique feeding and respiratory organ called a lophophore, which looks a bit like a rubber band covered with tiny hairs. Some brachiopods can cement themselves directly to hard surfaces; most have a stalk, called a pedicle, which they use to attach to a surface or to anchor themselves in the sediment of the sea floor. 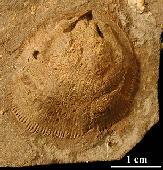 Brachiopods are very common fossils in Paleozoic rocks from many marine environments. First known fossil occurrence: Cambrian.